Low muscle tone and roller skates: two things that go together about as well as the proverbial fish and the bicycle. Or at least, that’s what I thought. Our 3-year-old son with Down syndrome was born with pretty low muscle tone, or hypotonia, which is very common with that diagnosis, but his tone is low even taking that into consideration. The exact explanation of low tone is twisty and slippery and hard even for those with a medical background to describe. Essentially, it means that fighting against gravity will always be harder than for the average person and that his limbs will be so flexible and loose that physical activities like running, climbing and gripping will always require extra work and practice. 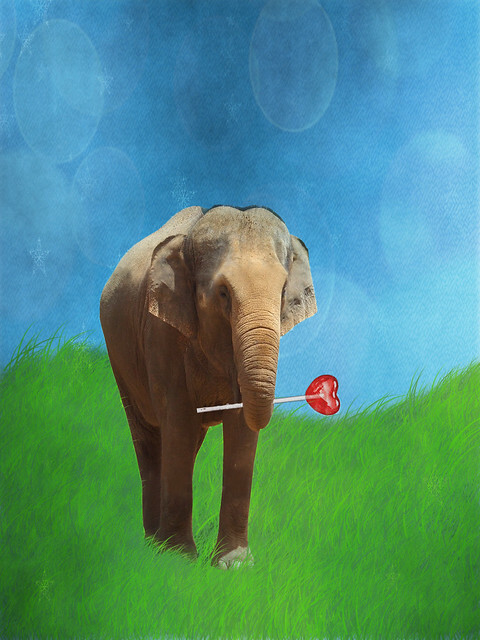 His trunk is also particularly weak, though with time, therapy and exercise, it has gotten much stronger. So it took him until past 14 months to sit up by himself, and longer than two years to take his first unsupported steps. I like to call him my little semolina noodle, because when he gets mad and doesn’t want to do something, he goes all limp and stringy and will not stand up on his two legs no matter how much you cajole him. He still trips and falls. A lot. He can tumble off chairs in a single bound, is not yet fully comfortable on a regular playground swing, and has had a few nasty encounters with concrete stairs. He also feels like he weighs about 50 pounds even though he only weighs 37. “Heavy, heavy!” as he likes to say. However, a miracle occurred at a recent birthday party. He was able to roller skate! My older daughter, age 6, had been invited to a skating party at Kate’s Skate. I debated about whether to bring all three kids, as it was a daytime party during winter break. The mother of the birthday girl kindly volunteered that everyone was welcome to come. We would later repay this kindness by alternately throwing all the spoons on the floor (little brother), spilling soda on the pre-set table (little brother and big sis), and falling into the cake and leaving a big smear mark (big sis) even before the candles were blown out. Um, sorry about that. (Blushing profusely). The last time we went skating there — the twins’ first time on skates — it was a disaster for me and my son. He could not even balance for one second on those devils on wheels. He cried, he whined, he moaned. It was a fundraiser for my daughter’s school and I held him up under his arms the entire two hours we were there. Luckily, one of our favorite teenage neighbors came along as a mother’s helper and she watched out for the girls. We’d skate on by the other parents, his shirt half hiked up from the effort, him writhing with discomfort, me gritting my teeth and cursing my decision to also wear skates. My back ached; my arms were about to fall off. Moms and dads looked at me with contorted expressions — was I torturing my child on purpose? I’d just smile back and give them that knowing eye-roll, as if to say “Kids… What are you going to do?” Inside I am saying, yes, people, I am torturing my child, and myself, because there are a couple of points to make here. The most important point is that kids with special needs can do anything their typical siblings can do. The other point is that tired, half-delusional 40-year-old moms of such kids should not be donning roller skates at 7 p.m. on a Friday night. But I decided to try again and just bring everyone to the roller-skating birthday party. Big sis never wants to leave her twin siblings behind — they must come everywhere with her, like beloved dolls. This time, at least, I would not be wearing skates. Maybe I would have my son not wear them either; surely he would remember his last traumatic experience and would not want a repeat performance. As we made our way to the counter where you trade your shoes for skates, another Mom passed by with her young sons in tow, both already on skates. I remarked that they were doing so well. She said yes, but that it had really helped that the wheels had been tightened. What? I asked, feeling like a cartoon mouse that has just realized the cheese had always been his for the taking because the mousetrap was broken. “Just ask them to tighten the wheels,” she said. “Then they barely slip around at all.” Could it really be that simple? Why yes, yes it could. The helpful young man at the skate counter smiled at my son and said “Hey buddy, you excited to skate?” No surprise, or wonderment in his voice, that a child with Down syndrome would want to skate. I wanted his nonchalance; said a silent prayer of thanks for putting this young man right here at this minute. He asked my son’s size and brought out a pair of skates. My son looked happy and started playing with the laces and trying to put them on. “Can you tighten the wheels?” I asked. “Is that good?” came his reply, after a quick adjustment. “All the way, please,” I responded. And just like that, we put on the skates. He stood up. 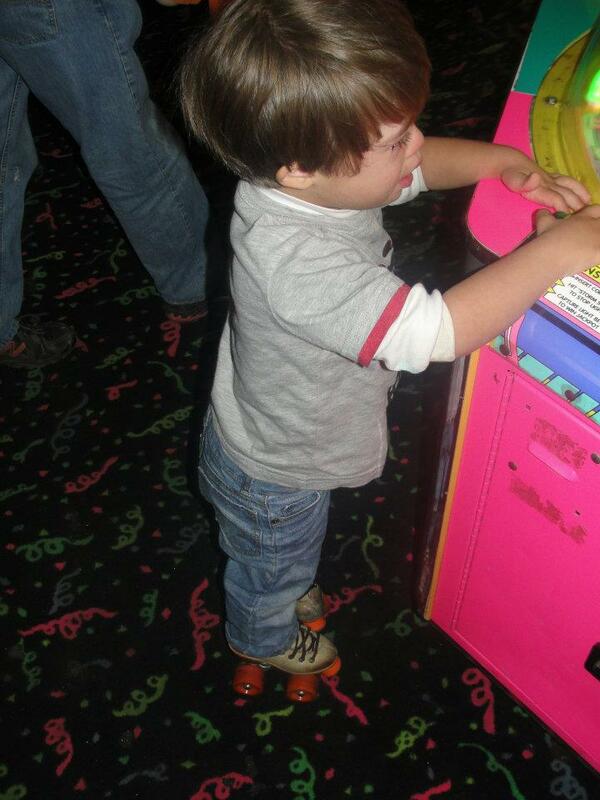 My son with Down syndrome stood up on roller skates — four wheels under each foot — and did not fall. I held his hand for the first few steps, but after that, we both realized he could get around on his own. Sure, he wasn’t actually skating — it was more like a shuffle, but he could move without much assistance, slowly, and be just like the other kids. I’d stand right by him and hold his hand if he needed it. If. It was time for the party to begin. Excited kids, most unsteady on their skates, headed for the center of the rink. Mine were no exception, squealing with delight. They all felt the gravitational pull of the friendly mascot, a large dog on roller skates, and waited their turn for a hug. I stood slightly in the distance, holding no one’s hand. At that moment I started thinking about one of the greatest gifts of parenthood, or of the universal human experience, really: a whole world of emotional highs and lows that bubble way inside you, a landscape of deeply felt experiences that no one else can see or share, but that make your own life rich, transcendent even. To the casual observer, I probably looked just like any other mom there. Smiling, watchful, ordinary. They would see the giant costume dog and the poorly lit roller rink; they might feel the thump of the dance music and hear the children’s laughter. Nothing of note happening here, people, move along! If they got closer, they might have noticed my eyes welling up with tears, but never would they realize how filled up I was with pride for my son, for his perseverance, his determination to be his sisters’ equal. That he was roller skating was not my choice, but his. It’s happened before: We take him someplace new, unsure of how he will react or how much he will be able to participate. When it works well, it always seems slightly miraculous, because so much emotional effort has been invested. When it doesn’t work, we may feel frustrated, but we usually understand why. This time seemed different. I hadn’t thought much about it, because I just assumed he wouldn’t want to roller skate. That he was able to — that he wanted to — was a gift out of the clear blue, an unexpected delight on a random Wednesday afternoon. A minor adjustment — tightening the wheels — made it all possible, but his will sealed the deal. I will try to keep this in mind when contemplating his future. When I am unsure of what direction to take with him, I will try to present him with the path that leaves open the most options, even if some of those options include failure. Maybe letting him make the choices sometimes could be the best answer to the everlasting question: What do I do now? In this season of tallying up, starting fresh and counting one’s blessings, I am grateful for many things: my loyal readers, a healthy family, a funny husband, loving parents and friends, a comfortable house and Carolina sunshine. But in particular, I am also grateful for my son’s outlook on life. You see, he is a 3-year-old with Down syndrome, and among the many things this means is that he takes things literally and doesn’t interpret things the way the rest of us do, often to comic effect. One recent ordinary Sunday, I was making lunch and our daughters — ages 6 and 3, our son’s twin — were coloring. Our son was flitting around from thing to thing as he is wont to do, and my husband was putting up shelving in the garage using a drill. From inside the house, the sound of the drill was amplified and each time it hit the wall, it made a high-pitched buzzing/trumpeting noise that sort of sounded like a large animal pushing against the wall, noisily wanting in. To our son, who loves animals, this sounded exactly like an elephant. He animatedly made the sign for elephant and said “El-phant!” Each time the drill made the sound, he would run over and pull at me, saying “Mommy! El-phant!” I would smile sweetly and say “Yes, it sounds like an elephant, doesn’t it?” How cute, I thought. But it didn’t stop there. Pretty soon, his excitement reached a fever pitch and he was standing on a chair, emphatically saying “EL-PHANT!” Not just once, but multiple times. And he was looking at the rest of us going blithely about our business, totally unenthused about the angry elephant sound. How boring were we, he seemed to be thinking, how unmovable. Humph, was his expression. Well, enough of this elephant business, I thought. It’s time for lunch. “Go wash your hands,” I told my son, pointing to the bathroom, which was right on the other side of the wall from the elephant sound. 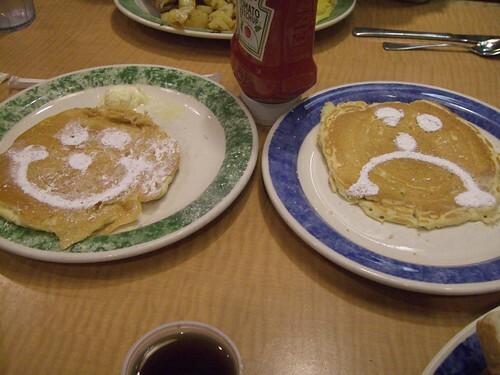 “But…” the look on his face said, wordlessly, as his expression turned into a pitiful little pout. He pointed to the bathroom and said softly “El-phant?” Mommy, you seriously want me to go in there WITH THE ELEPHANT? Then we all gladly took him into the garage to show him what was really making that noise. But he was not swayed. Every time the drill buzzed, he still said “El-phant!” Exclamation mark his. And I felt slightly jealous. After all, wouldn’t a world where pachyderms stopped by for PB&J be infinitely more exciting than one where toddlers took naps while moms swept crumbs from the floor?